The Hartwood FSC Large Woodstore offers you a truly breathtaking place to keep all of the wood for your fire or for work you are doing in your shed. 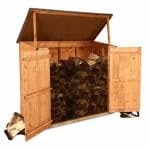 This is one of the most eye catching woodstores that you can buy. Its large size not only gives you more room than you will ever need to keep a good stockpile of wood, but it also makes this one of the most eye catching places to store your wood. With a lovely overlap cladding roof it really will be something that gets many compliments over the years as it stands in your garden. Not many woodstores manage to provide you with plenty of storage space, good looks and a strong design like this one does. Speaking of strong design this is achieved thanks to those slatted sides which go all the way around the back of the woodstore. 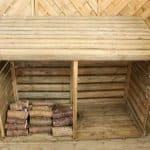 This will protect your wood from getting soaked by the rain, but it also allows it to get fresh air to help keep it dry. Your wood will get plenty of air from underneath as the floor is actually raised thanks to some large floor bearers. The whole structure is very solid and will give you many years of use, thanks to the thick frame that is keeping it all together. Here we have one of the larger and more impressive woodstores that we have seen in quite some time. The Hartwood FSC Large Woodstore is one very well made structure that has a lot of personality to it. 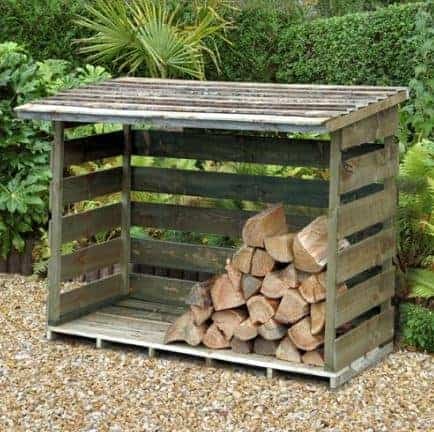 This is going to be the perfect place to store a vast amount of wood so that your log fire or personal DIY projects you have going on, never run out of wood to use. This is one very impressive woodstore from a size point of view as it is a little over 6 feet wide and it is 2 feet 8 inches deep. So as you can see, you can really store a whole lot of wood inside of here. No more tripping over logs or them getting caked in mud when you use this. 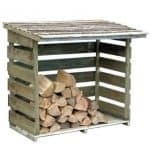 The log store stands at 4 feet high at its lowest point so you can really pile the wood up quite high inside here. The roof that they have gone for really is quite impressive. It is a pent style roof that is made with some lovely looking overlap cladding. 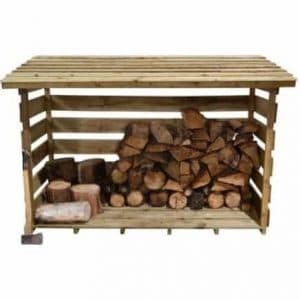 This is a very interesting design choice and while of course this roof is going to keep the rain off the logs, we are sure they chose this design for the roof as it makes the woodstore stand out and it will certainly make it a more charming feature as it stands in your garden. This is one of the most cleverly designed woodstores that we have seen and a huge part of this is down to the slatted sides. Rather than use a traditional form of cladding say overlap for example. They have used thick boards and made sure that there is plenty of room for air to get in the log store to keep your wood as dry as possible. They have not just put these boards on the sides they are actually on the back as well so your wood is going to be very well protected during the winter inside of here. We are very pleased with the frame that is keeping the woodstore together. 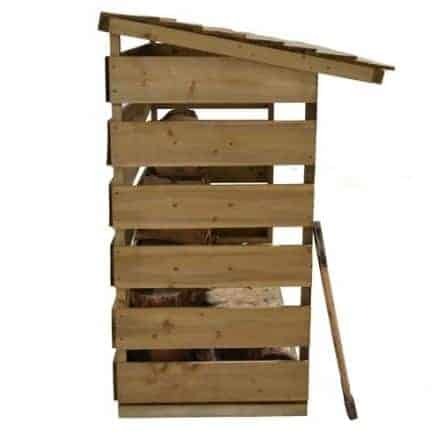 While they have not said what the exact size of this frame is, we can see with our eagle eyes that it is a well made, thick and robust frame that is going to really ensure that you have one very sturdy log store on your hands. The framing and the slatted sides and back will form quite the team and make this something you can use for many years. Flooring in woodstores is something that is not always included so we were very happy to see not just a floor, but a very well made floor inside of here. This flooring is made with a similar kind of boards as the rest of the structure and they are slatted so to let in air from below as well. One thing that they have done which was really smart was use large floor joists so that the wood is a good few inches of the ground. A generous coating of treatment should be applied to all of the wood shortly after you have installed it. Most manufacturers will tell you to do it within a few weeks, but we always feel that once you have installed the woodstore it is best to do it then. 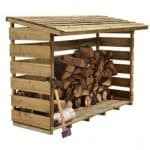 Do you really want to build it, put your wood in, take the wood out, treat the woodstore then put all the wood back in? Save yourself the trouble and give it a good coating once installed and then again on a yearly basis. If you look after this right then you will never have any problems with rot. 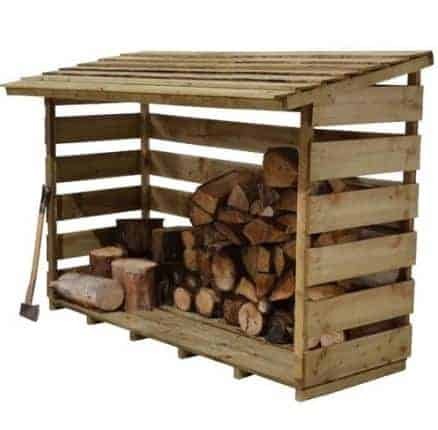 The Hartwood FSC Large Woodstore does come with a 15 year anti rot guarantee, but this is only valid as long as you take proper care of the woodstore. This is one of the best storage areas of any woodstore. 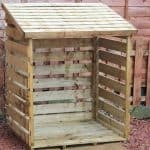 Not just because it is offering you just an incredible amount of storage space, but because of the slatted sides and floor your wood is also getting a good supply of air to help keep it as dry as possible. Yet at the same time the wood is not going to be overly exposed to the elements. All in all we really could not be any more impressed with the storage area of this woodstore. With this being so well made and actually having a back and a floor, you will find that this is one very robust and secure structure. It is so well made that if you have kids you best prepare for some arguments with them about using this as some kind of fort. Even the gustiest of winds is not going to be able to move this. Even without being filled with wood this is still one very stable woodstore. 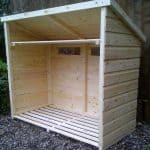 While they are not offering any customisation options with this woodstore if you did want to brighten things up a little bit then you could give it a lick of paint. Or if that is a little bit too much, you could always treat the wood with a treatment that is coloured or even one that will lighten or darken the wood. This is one of the most complete woodstores we have seen. By that we mean there is literally nothing else you have to buy. Well there is wood to fill this with and as awesome as it would be, we do think expecting this to be filled with logs when you buy it is pushing it a little bit. 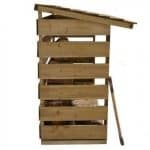 We have seen many woodstores and we are comfortable saying that this one here is one of the highest quality ones we have had the pleasure to look at. They really have made sure that this is high quality from the top to the bottom. With its very smart design and the materials used, we feel that you are going to be able to use this for a vast number of years. It does require a little bit of TLC, but nothing that is worth complaining about. 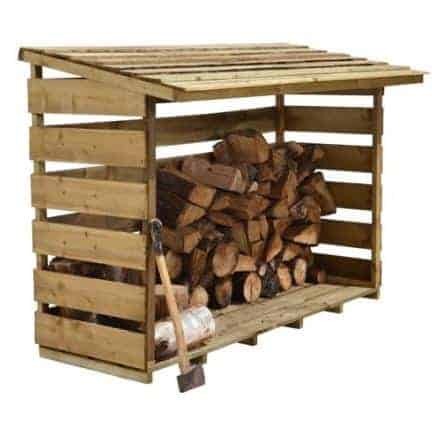 The amount of storage space offered by this woodstore really is quite amazing. You are going to be able to fit in a whole load of wood inside here and maybe even a few other things as well. We do not see you having any problems installing this, but if DIY is not really your thing it is always best to have a friend helping you out. This should take no more than 2-4 hours to install. 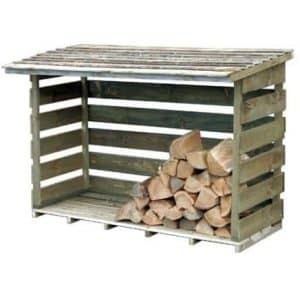 We know to some the price may seem a little high for a woodstore, but this is one of the very best and we assure you that you are getting incredibly high quality for your money here. Final Thoughts: The Hartwood FSC Large Woodstore certainly is something that made quite the impression on us. It is just so well made that anything negative we do say is really just us nit picking. They have done just a wonderful job in selecting the right materials, the overall design and in general just making sure this is one excellent product. Its large size and good looks make this something which is really going to stand out in your garden. Just make sure that you do actually have the space for it as the pictures really do not do the size of this justice. 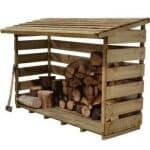 This really is one of the best woodstores we have seen and if a large woodstore with some serious style is what you are looking for then we highly recommend this.